Kalkulo has developed several technologies in close interaction with our clients. Some of these technologies are proprietary and represent competitive advantages for the clients, while others are owned by Kalkulo and available to the market. The following survey highlights ready-to-use technologies that you can license as products or which we can use as basis for customized solutions to your problems. The 4DPlates product has been developed in close collaboration with world-class explorationists in Equinor over several years. The resulting technology allows easy import and orchestrated co-visualization and analysis of a wide range of data types that are relevant for multi-disciplinary analysis of geological scenarios through tens and hundreds of million years. Using public or proprietary tectonic rotation models, your data sets are automatically broken up into appropriate puzzle pieces. By the interactive pull of a geological time slider, these pieces can be moved to the positions where those geological structures once belonged. The 4DPlates software can be used seamlessly at all scales - from the global view to basins and down to reservoir scale, and gives you a consistent insight into the depositional environments that governed the creation of the geological structures we observe today. Bringing together cross-disciplinary teams, you and your colleagues can reach a consistent conclusion honouring all the data sets you have taken into account. In this way, 4DPlates plays an invaluable role as a knowledge integrator and a geological storyteller. While the 4DPlates technology is owned by Equinor, Kalkulo and its subsidiary ReBasin Technology have an exclusive license for commercial exploitation in terms of product licensing, geoscientific consulting, and customized development. Further information about the 4DPlates technology can be found on ReBasin's web site. For enquiries regarding use of 4DPlates, feel free to contact us. 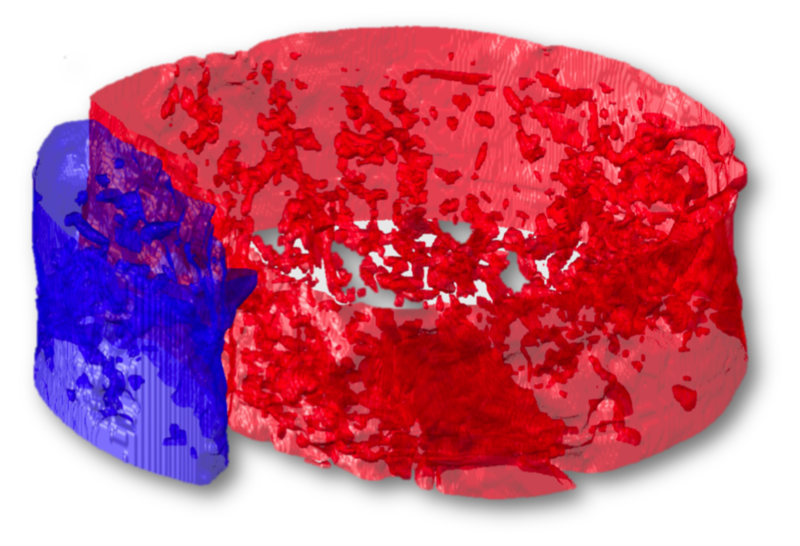 In close collaboration with Lundin Norway, Kalkulo has developed the Core Modeler, which provides a fully digital laboratory for handling CT scans of well cores, with particular emphasis on carbonates. In addition to state-of-the-art volume rendering of the digitized cores, the Core Modeler assists in quality assurance, integration, and calibration of the acquired data. Integrated tools allow interactive estimation of porosity, detection of fractures, classification of lithology. Moreover, digital samples of the core data can be used as basis for flow simulations and corresponding estimation of permeability. The acquired CT data can be co-visualized with measured and generated data logs. For enquiries regarding use of Core Modeler, feel free to contact us. Oil and gas exploration and production in ice-covered waters are very challenging tasks, and a potential threat to sensitive environments. Making good use of all available information is crucial for correct design and execution of installations and other offshore operations, and plays a key part in maximising human and environmental safety. Together with Aker BP, Kalkulo has developed the MetOcean product for interactive analysis of meteorological, climate, and environmental data. The software supports import and aggregation of transient geospatial data from a wide range of sources, covering both physical observations and quantities derived by means of numerical and statistical models. 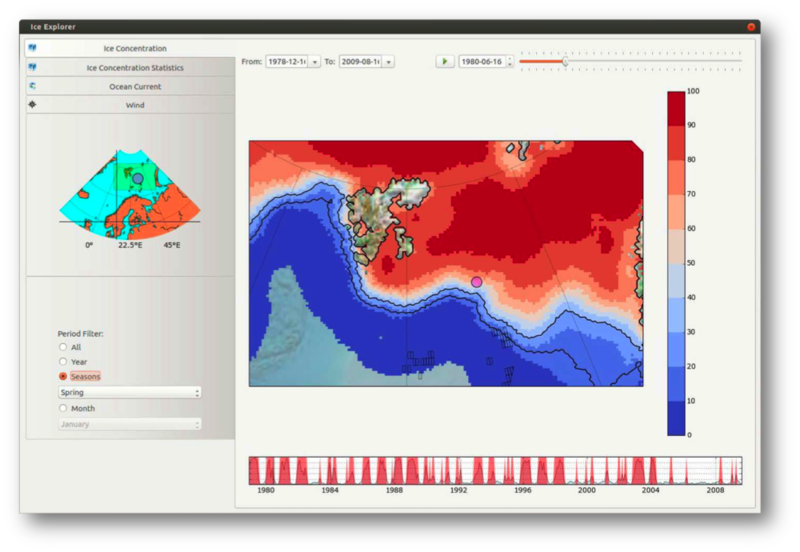 Combining these data and extracting the relevant information, MetOcean provides decision support that can be interfaced to existing and new workflows in the company. The MetOcean software is based on Kalkulo's DIDSy platform, which provides a graph-oriented representation and execution of live data pipelines, see below. While the MetOcean software addresses the specific needs of environmental and operative decision support in ice-covered waters, the MetOcean/DIDSy combination would also provide an excellent basis for other ocean-related data challenges. For enquiries regarding use of MetOcean, feel free to contact us. Torch is a power­ful tool for wind farm owners that want to maintain their power plants more efficiently and maximize long-term profit. The product is developed together with Statkraft, and provides important functionality needed for business decisions that is lacking in the standard tools used by the wind industry. By interactive and totally transparent analysis of data acquired from all turbines in a wind farm, or even across a collection of wind farms, Torch delivers the insight needed for making the correct assessments and the right decisions. With Torch at hand, wind farm owners can efficiently identify underperforming turbines, quantify lost production, document claims for compensation for underperforming turbines, detect early warnings from the turbines, reduce maintenance costs, and optimize the development of future wind farms. The Torch software is based on Kalkulo's DIDSy platform, which provides a graph-oriented representation and execution of live data pipelines, see below. While Torch addresses specific business challenges associated with running wind farms, the Torch/DIDSy combination would provide a high-level starting point for efficient management of other types of clustered energy producers, such as in hydroelectric, solar or geothermal energy plants. Further information about the Torch technology can be found on the Torch web site. For enquiries regarding use of Torch, feel free to contact us. Kalkulo's Data Integration and Decision Support System (DIDSy) is an application-agnostic platform for graph-oriented representation and execution of data-driven pipelines or workflows. All handling of data, from data import, to filtering, to statistical analysis, is represented in a computation graph. The flow of data in a graph is immediately intuitive and transparent, since the data processing is separated into individual steps that can be traced and customized. In many applications, the data in question are observed or computed time series, such as the information extracted for each wind turbine in the Torch software. If relevant, the transient data can also be given geospatial associations, thus providing the source of time-varying maps such as in the MetOcean application. For enquiries regarding use of DIDSy, feel free to contact us. Originally developed for the hydrological division in Statkraft, the TSView platform allows efficient interpolation of transient geospatial data taking into consideration given constraints. 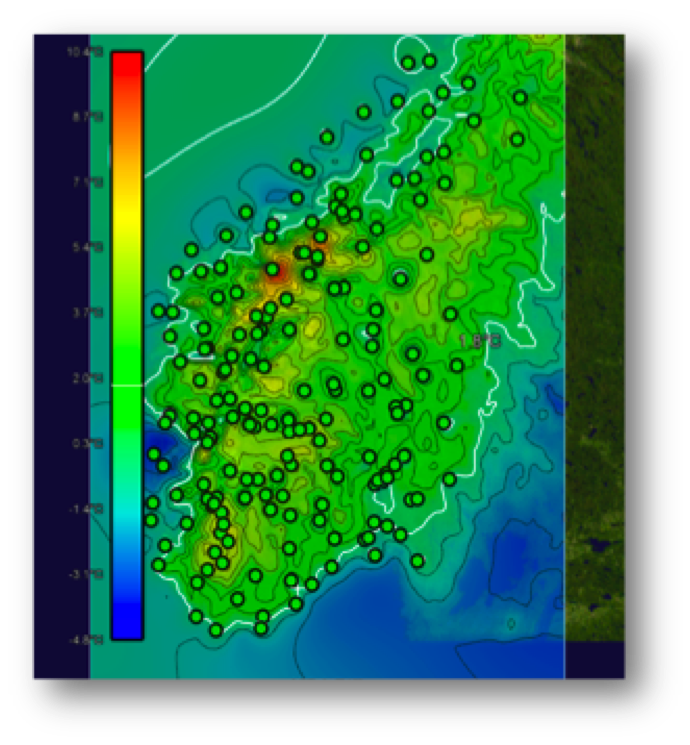 In particular, TSView has been used to automatically generate temperature and precipitation maps based on measurements from Statkraft's weather stations spread around Norway. In this application, imposed constraints prevents non-physical effects to occur as numerical artefacts of the interpolation process. The consequences of low-quality or disrupted measurements can be easily investigated by interactive exclusion and inclusion of observations, individually or as groups. For enquiries regarding use of TSView, feel free to contact us. The Kalkulo Application Framework (KAF) is our internal development platform that kickstarts most of our development projects. KAF contains a comprehensive collection of general purpose programming tools for data management, user interfaces, and visualization. 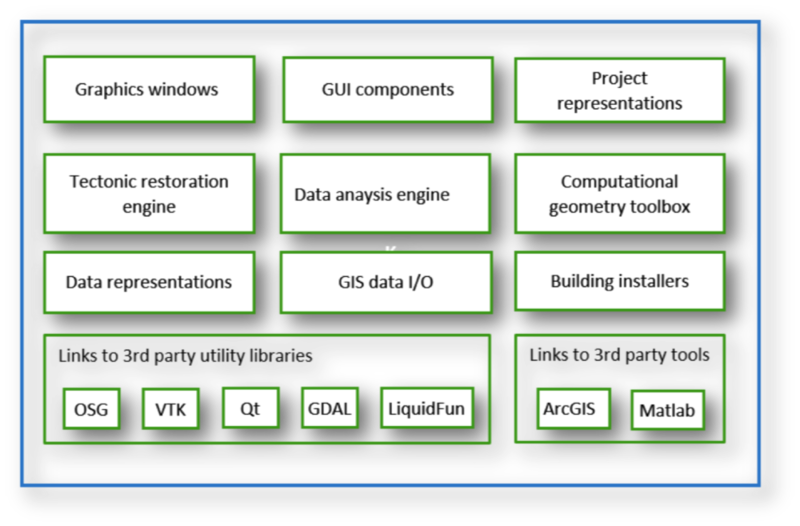 In addition, the platform provides high-level access to several software libraries specialized for handling geospatial information and for geometric modeling. KAF also interacts with the graph-oriented compute engine in DIDSy. Most of the technologies listed above are using KAF as their foundation. For enquiries regarding use of KAF feel free to contact us.